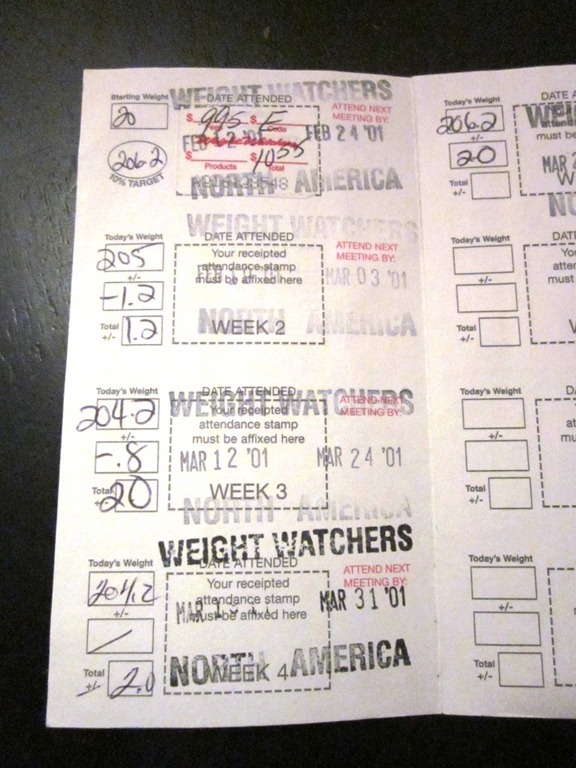 Some people don’t take me seriously when I say that I’ve been doing Weight Watchers for as long as I can remember. I think a lot of that has to do with the fact that I’m relatively young and seem pretty fit now. I can’t really blame them because sometimes even I forget just how long it’s been since I first started to think about food in terms of “Points” and to develop the weekly weigh in rituals that still haunt me to this day. But then, something will happen to make me realize that I’m not exaggerating at all when I say that I’ve been on and off the program since I was a kid. Like this past weekend, when my mom brought me something she found at the house while going through some old papers. Those of you who have ever done Weight Watchers know exactly what that is, but for those of you who have been fortunate enough not to need the program, this is a weight tracker, where your weight is recorded each week to keep track of your progress. In the hours leading up to your weekly meeting, you eat and drink as little as possible, and use the bathroom as much as possible to ready yourself for the moment of truth. When the meeting time has finally come, you anxiously approach the scale immediately upon arrival and hand this little gem over to the receptionist. Then it’s time to strip yourself of every article of clothing and jewelry you can possibly manage to take off while staying decent, before you step up on the scale to see how your week really went. Can you see that date on there? February 2001. This means at the ripe old age of 16, I weighed in at 206.2, about 40 pounds more than I weigh today as a 26 year old. The “funny” part is that this tracker isn’t even from the first time I did Weight Watchers, because I know tried the program at least a few times before I was in high school. So this whole story gives you a little background on why this week marked such a major turning point for me. 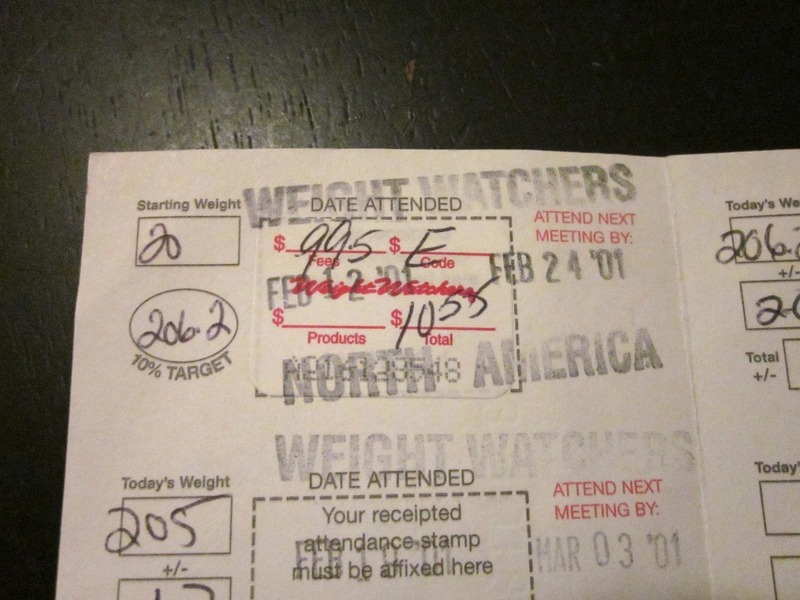 For the first time in my life, I was on the receiving end of the weight tracker because I started training to be a receptionist for Weight Watchers – one of my long term, and (what felt like) completely unattainable goals. I honestly had no idea what it would be like or whether I was going to feel nervous or actually be able to do it, and I will say it’s harder than I was expecting. I’ve been going to a computerized center for the last several years, where you step on a scale and your weight goes directly into the computer and everything is automatically calculated. For training though, they have you at a meeting where it’s all paper based and done by hand, so that you’re able to work at any meeting once you are trained. But besides the fact that I still have a ways to go on learning the right way to fill out all the paperwork, the experience itself was incredible. Being able to excitedly tell people just how much weight they had lost that week and seeing the happy glow on their face was amazing. On the opposite end of the spectrum, there was a girl who broke down because she was doing everything right and the scale just wouldn’t budge. It was so awesome and rewarding to be able to jump up from behind the table to hug her and tell her I knew exactly what they she was going through and had been there many times myself. And I really meant it. Once the excitement died down a bit and everyone was weighed in, I sat there looking out over the meeting and smiled to myself because I realized something. I finally feel like I’m where I was meant to be. Have you ever had a far out goal that you never thought you would achieve? Wow, what a powerful post Beth! 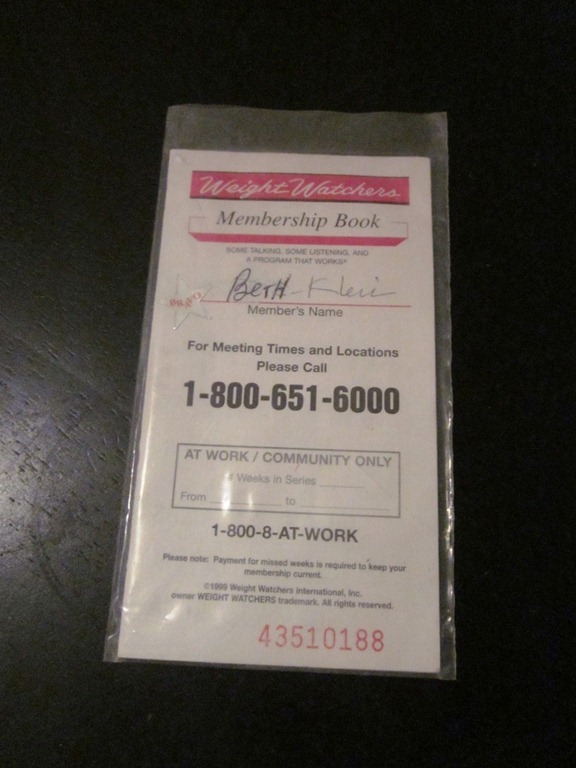 I can’t imagine how great it would feel to finally move from being weighed in to being the WW receptionist. I think it’s really nice that you were able to help that girl, because you can really empathize with the struggles! That’s amazing! I hope you be where you are now someday. Might be a while, though, because I’ll be lucky to make it back to goal before we start trying to get pregnant. You’re post brought a little tear to my eye. I feel like I am in the same place you were. I’ve been on and off weight watchers since I was 16. I would love to work for them someday, but it too seems far away now. You are such an inspiration. Congratulations on finally meeting your goal! Great post Beth!! I’m so happy that you are where you’re meant to be. A far off goal that I thought I’d never achieve is running a marathon. I never enjoyed running before deciding to train for one, but I stuck with the training and completed the marathon. It felt really good to accomplish something that was a big hurdle for me! Wow. I found one of those books a few months ago from the first time I tried WW at the ripe old age of 12. My goal weight (determined by someone at WW) had been 115. I was 5’9″. I remember even then knowing that I was never going to weigh 115 though I don’t remember much else about that experience. I am not yet where I was ment to be, but I am on the road. I can see the mile markers everyday! Beth I am so happy for you for working for WW! If there is anyone who could be inspiration for other members it is you!!! what a great post Beth! congrats on getting here and feeling so good about it. yes. i felt the same way the first day i got my new job. i thought-finaly! Great post, Beth! I have the same little ww book from 2001. When I think about my own weight loss adventure, I can’t help but associate you with it and ten years later you are still part of it because your blog inspires me and you inspire me! Thanks! Great post! That is amazing to find a tracker from 10 years ago. I bet it would be even more fascinating to find a points tracker to see how much your diet has changed. Good point! I can’t even imagine what I was eating back then! Thank you SO much for writing this post! I, too, have been at the mercy of WW since high school, being on and off the program since my sophomore year of high school… so 10 years. As I read through this, it was as if I was reading my own thoughts about the whole WW process, from the pre-weigh in rituals to finding it so hard to think of food as FOOD, and not just a Points value. Darwin said something to this effect, “It’s not the strongest or smartest that will survive, but the one most likely to adapt.” Changing over (adapting) to the new program is an important step so that you can reach your future goals. … I’m doing PointsPlus now too, I find that portion control is very important. Thanks Maryann! I’m actually not at my goal yet, still 6.4 lbs to go. So I have to get to my goal and maintain it for 6 weeks to be Lifetime, and then hopefully I can start leader training pretty soon after that! I meant to say “Great post Beth”. haha sorry about that!! we call the place I work the cube farm, so I can relate! No worries, in times like these, I just pretend to start coughing my head off so it looks like I was choking on something and that this was the real reason for my eyes tearing up. 🙂 Its all good! That is so cool to read about meeting a long term goal that involved so many struggles along the way. A lot of people would have given up (hence our skyrocketing obesity rates), but you hung in there! (Also, on my 30th birthday I weighed less on than I did on my 15th. Isn’t it kind of cool to be like that). I guess one far-out goal that I achieved was getting into MIT. Thirteen years later, I still don’t believe it happened. I’m really glad you are loving your new role. It’s so great to get started in a job with something you’ve been so involved in- through all the ups and downs! Amazing post Beth! I can feel the emotions behind how you explain the weigh ins, whether they end up how the participant wants it or not. I think having the support of someone who actually went through what they’re going through makes it that much more comforting. Wow, I didn’t know you’d been doing WW that long. Congrats on how far you’ve come! I remember talking in history class sophomore year (I think) about how to get out of running in gym.. hah! Awww congrats. You’ve come full circle! Love this post! You are such an inspiration. Congrats on sticking with it and almost being at goal…you are a great inspiration to me and so many others! I see that its been a long, difficult journey for you, but its amazing that you are able to give back and let others benefit from your experience! I think this is such a good thing for you. I’m glad it can turn into a career for you. You’re an inspiration and you should be telling your story for other people at meetings! I love this post. And YAY YOU for following your dreams and goals and finding your place in the world. Your experience and warmth will be SUCH a benefit to your members. Take care, and have a great day! Really great post Beth. VIBES to you. Congrats on meeting your goal! 🙂 I think working for Weight Watchers would be pretty cool and it sounds like you are already great at it! I do WW online because of my schedule but I really miss seeing everyone’s weighing in rituals! One lady would strip down to bike shorts and a sports bra! lol! That is the best part (aside from losing of course tee hee) of WW – everyone there KNOWS where you are coming from and what you’re going through. I’m sure that this is going to be a GREAT fit for you! Thanks Gwen! I do really love how you have to have gone through the program in order to be able to work for them. it makes SUCH a difference. And I love your description of the weigh-in. Haha, I feel like it is this experience that only WWers know and share. I would want someone like you to be my leader if I ever went to a meeting or rejoined the program. That was a great post and story. I’m so proud of you. You have worked so hard and now its time to keep inspiring others to be exactly where they are supposed to be!